Writing for the Grani.ru online newspaper, journalist Vitaly Portnikov comments on the developing offensive launched by Georgia in the breakaway region of South Ossetia. Military experts are already describing the conflict as full-fledged war which could continue for an extended length of time. According to media reports, Russian reinforcement forces have now entered the area and Russian jets have bombed some sites within Georgia’s borders. The European Union and NATO have called for a cease-fire. For further background on the subject, read coverage from The New York Times and Bloomberg. Update (August 9): Read up-to-date coverage from CNN, the Kommersant newspaper, The New York Times, and the BBC (with video). Update 2 (August 10): Georgia Pulls out troops, calls for cease-fire (AP and BBC). Two journalists die in S. Ossetia (AP). Russia brushes aside calls for cease-fire (The Guardian). Update 3 (August 11): Russian troops invade Georgia, take Gori (The Times). Russian television channels, having forgotten the Olympics, are broadcasting reports from the shelled [South Ossetian capital] of Tskhinvali. Russia’s representative in the UN Security Council, Vitaly Churkin, is talking about a loss of faith in the Georgian leadership. The head of the international committee of the State Duma, Konstantin Kosachev, is calling for Georgia’s isolation. There’s no point in being astonished at such words and emotions: there is a real war in the region, houses are crumbling, people are perishing. But if Russia’s leadership listened closely to the statements of their Georgian colleagues, they would recognize themselves –only during the period of their own war in the Caucasus. After all, what did they speak about in Moscow during the epoch of carpet bombings in Grozny, street fighting in the Chechen mountains, “clean-up operations” (this word [zachistka] has become so widespread in the Russian language, that it is now used for any reason – both when a business needs to be taken away and when a parking space needs to be found)? They spoke of restoring Constitutional order. And were absolutely certain –not just the authorities, by the way, but a large part of society –that the best method for this restoration was precisely war, and not a tiresome negotiation process. That shooting enemies was much wiser than finding allies. And has the the opinion of what happened really changed now? Doesn’t the modern Russian leadership pride itself in the restoration of Constitutional order in Chechnya – even against the background of a deteriorating situation not only in that Republic, but in the neighboring regions of the Northern Caucasus? The Georgians also talk about restoring Constitutional order. It was precisely this kind of restoration that Mikhail Saakashvili was preparing for since his first day of coming to power – because he desperately wants to resemble Vladimir Putin. And if anyone can blame the Georgian president for this, it’s his Western friends. But we of the former Soviet Union know: the society here adores the victor with his bloody saber bared. Experienced diplomats, devoting their lives to the negotiation process are out of favor here. In this situation, incidentally, Russia had one clear advantage –in the period of the Caucasus war, she did not have an unfriendly country of such size and such capabilities near by. For precisely this reason, restoring the Constitutional order in South Ossetia is a risky operation for Saakashvili. Provided we’re not dealing with a banal exchange, agreed upon by Tbilisi and Moscow: you take Ossetia, we –Abkhazia, which is too hard for you to crack anyway. You’re the victor, we’re the peacekeepers. And everyone’s happy. And the dead –these are already trivial matters. The death of one person is a tragedy, the death of millions is a statistic, as said [Joseph Stalin], the last commander equally close to the Russian and Georgian rulers. But if the matter at hand isn’t about an exchange, but about an uncoordinated operation to return the territory of South Ossetia into Georgia, then we will have to live through a full-blown war. After all, even the capture of the near-border Tskhinvali doesn’t signify the end of the conflict. And it isn’t likely that Moscow can elect not to intervene –not so much from the point of view of their relations with Saakashvili, but thinking of their positions on the North Caucasus. 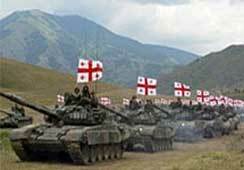 To “surrender” South Ossetia– is to demonstrate to the people of the region once again that the authority in Moscow is just as foreign and indifferent as the authority in Tbilisi. Simply put, “surrendering” South Ossetia today, one can lose North [Ossetia] tomorrow. And if one looks at what’s taking place through the eyes of Dmitri Medvedev and Vladimir Putin, and not Mikhail Saakashvili –then one cannot help but ask the question: Is Georgian nationhood worth such sacrifices?